I graduated from university in 2000 and spent five years working in software development. At twenty-eight years-of-age and four stone overweight, I finally accepted that I was never going to be a rock star. I decided to try my hand at stand-up comedy. I’m one of those people who are always told by friends and colleagues that I “should be a comedian” – after hearing that enough times I decided that maybe I should. I was lucky, I had some early success: playing clubs up and down the country, travelling, meeting new people, and making money. I won a big ‘new act’ competition in 2006, at the Edinburgh Fringe festival which boosted my career and took me to the Montreal Comedy Festival and the Paramount Comedy Channel. I never quite made it. I never quite made it big enough or made enough money to be able to ditch the day job – but I loved doing stand-up. It was while working full-time in software development and travelling the UK performing stand-up that I had my first breakdown. I’d worked to the point of exhaustion and found myself – after being destroyed by a heckler and walking off-stage at a gig in Coventry – parked on the hard shoulder of the M5, unable to drive through the tears. I pressed on, believing that I could ‘walk it off’, that I’d be fine after a couple of weeks break. In 2012, after losing yet another job, I finally decided to get help. I went to see my GP and was diagnosed with depression and anxiety. I was given medication and have been taking anti-depressants, on-and-off, ever since. Six years later, I am still on medication. I’ve hardly stepped onto a stage this year due to anxiety and a catastrophic crash of confidence. 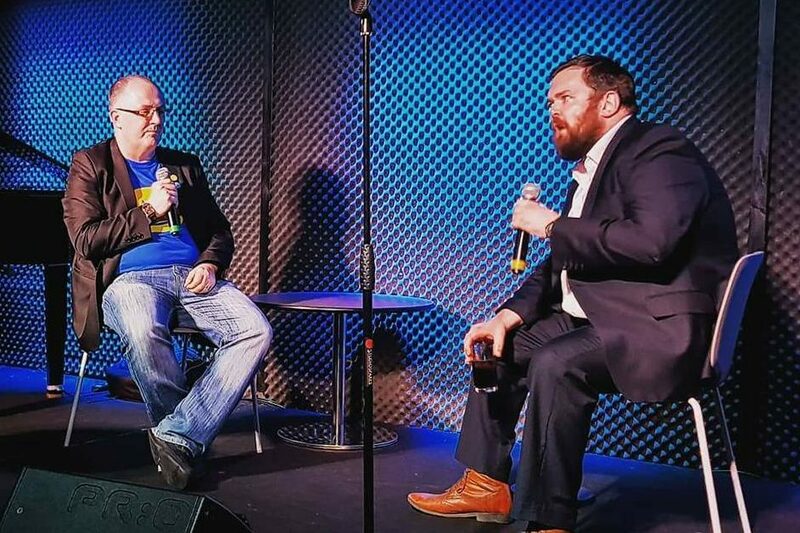 In 2016, after a divorce and a redundancy, and having lost a number of jobs, I decided to make stand-up my full-time career and to ‘come clean’ about my condition. I started writing a blog on my website and a new stand-up show, 40% Happy, that I hope to take to the Edinburgh Fringe Festival one day. During this time I spoke to my old friend, fellow comic, and neuroscientist Dr Dean Burnett for his second book, The Happy Brain. Again, I got lucky: after performing at the book launch for The Happy Brain in 2017, I was approached by BBC Wales to film a short piece for them about my experiences of depression and anxiety. This included the opportunity to speak with Professor Ian Jones, Director of NCMH, who gave me some valuable advice and some incredible insight into the work they do. I know a couple of people who work at NCMH so I was aware of the centre and its work but this was an incredible opportunity to take a peak ‘behind the scenes’ and to learn more. After speaking with Prof. Jones, learning about the great research work being done at the centre, and meeting some of the incredible team that makes it all happen I was thrilled to accept when asked to take part in that research and to become a Research Champion. Taking part was simple: two members of the NCMH team visited me at my home, at my convenience, and asked me some questions about my history, lifestyle, etc. They then took a simple blood sample and left me with a questionnaire. Job done. They were friendly, fun, reassuring and professional. I’d already spoken to Prof. Jones and met some of the team so I didn’t feel any anxiety until the day of the interview. I was quickly put at ease by my visitors and everything went smoothly. We chatted, I was informed about the whole process, and every question I had was answered fully. The work that NCMH is doing is vital. I would encourage everyone who is able to take part. I’m hoping that their research will help shed more light on this subject, bring more clarity, help dispell stigma and provide evidence to inform future education and policy making. Inspired by Wes' story? Find out more about taking part in our research.